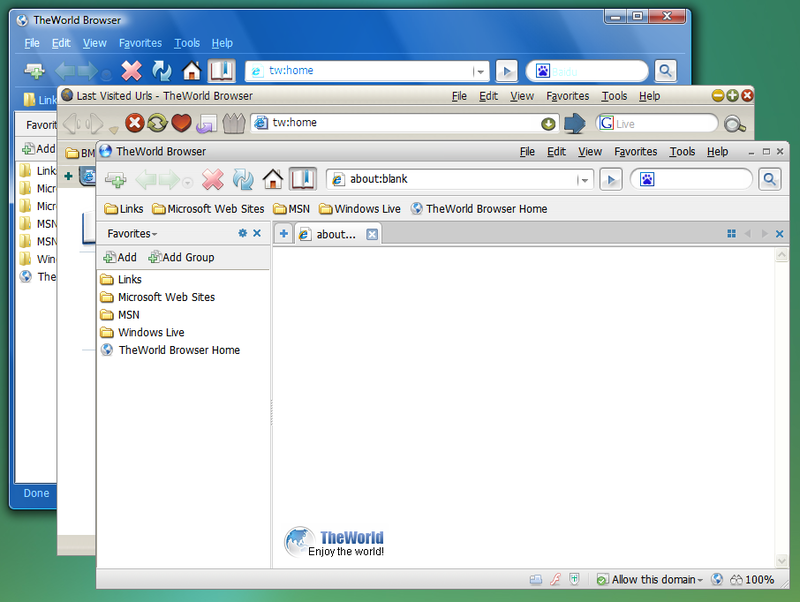 TheWorld Browser is a tiny, fast, safe, powerful, multi-tabbed with multi-threaded frame browser, it is a freeware with no function limited. It has a new, powerful multi-threaded window frame, which can avoid web page being out of response. It is optimized to avoid any case of out of response. In any test case, if a web page's browser window is out of response, the other windows will not be infected. stay tuned for 4.0 now in development ... Chrome will be the new engine. It uses Internet Explorer engine. In my book that's a stab in a back. No use. Nothing using IE engine can be safe for browsing. I was hoping it would be using a proprietary engine... I give it two stars because I don't like giving one. betasun, dont know why tab position isnt part of the options but here is a quick fix. Locate 'theworld.ini' generally in 'C:\Program Files\TheWorld 3' and search for 'TabAlign=1'. Change 1 to 0. Modify the above file only when the browser is not running. After the changes, startup the browser and you should see what you want. In general, less bloated, very much active development and stable. Really NEW one! I like it. Yes, there are some little roughnesses, but hope they could be corrected. I'm used Maxthon for last 3 years, and now so bored - it's bloated, crushed. And this browser is really promising. Good luck! a useful option is not present in this version :TAB PLACEMENT ,top or bottom . update: after using it for a while it began to freeze up and became exceedingly slow. I uninstalled it, but I'm going to reinstall and give it another shot. I reinstalled it and still it was very buggy and slow. I uninstalled it again, probably for good. Nothing new to the table, just another browser to flood the ongoing figth to win the browser war... enough already. If I don't see another "NEW" browser in the next 30 years, I won't care!! Bland and typical. Try harder to get more attention. Its getting there. My missing RSS viewer is added as a plug in. Quite cool. UI looks impressive and browser very promising. So far so good. Edit: Looks like its high on resources (RAM). This application's description is just begging to be featured over at engrishfunny.com -- I'm giving this one a 5 because "if a web page's browser window is out of response, the other windows will not be infected." if it opens at all, takes a real long time...when it doesn't(most of the time), it forces you to close several instances of each in something like Task Manager- one by one...before being able to open it again gltch free. Its session restore is a good idea...ALTHOUGH it wants to open already-closed(ergo unwanted) tabs too. AND... it would be nice if a save to group option were added to that restore page. Its Download Manager is good-- particularly its useful Open File button that is immediately available, saving unnecessary clicks / dialogs. TheWorld needs to implement the tile tab funciton found in FlashPeak SlimBrowser, and further improve it by allowing particular tile configurations / positions to be saved, so as to not have to reconstruct them upon each browser reopen. If FlashPeak and TheWorld could be melded into one, it'd be awesome. Very impressive. Bit of a Maxthon knock-off but I love it. Too bad it's IE based. Three stars. Flatline. Good points: it loads FAST, as fast if not faster than Greenbrowser, a lot faster than Maxthon and Firefox. And it works natively with Roboform. Bad points: 1) You can't turn off the skinning, which means that there is a performance hit each time you close or open a new tab due to the drawing time (when you're used to having that happen instantly, it's mildly annoying). 2) Doesn't work with WebEx online webconferencing. Webex kicks in an auto-refreshing URL to start your meeting and this is one of the browsers that doesn't work with it. Greenbrowser, FF do. Maxthon, Avant and TheWorld do not. That's a bug. Brought it to the author's attention in their forums, they've done squat to fix it. That's a dealbreaker for me. This browser goes onto the backburner until the skins can come off and the Webex compatibility is fixed. Most of the comments are right on. This browser is generic, and also geriatric in it's philosophy.